What’s the deal with Battleborn, yo? I was all ready to talk about Shovel Knight, the “8-bit, Nintendo-like’ side-scroller that was released on PC this week and is the talk of the video game world. Then it happened… the headline that hit my optical holes like a ton of Bricks (yes, the name of my favorite character from the original Borderlands)… the accompanying trailer that turned me into that dramatic chipmunk that has millions of hits on Youtube. Whhhaaaa!? You mean the company that brought me Borderlands 1 and 2, gave me hundreds of hours of unadulterated loot and shoot joy with my friends, memorable and genuinely funny characters, and the short film “A Meat Bicycle for Two” (seriously, go Google it for a laugh)… they are coming out with a new IP that sounds just like Borderlands?! And suddenly everything else stood still. So what did we learn in the trailer? The first 55 seconds of this 2:25 trailer features a gaunt but very capable elf-like girl with a very stylized bow running through Ferngully (or something like it) from magical missiles. The art style immediately makes me think of many animated films I have seen, and, much like Borderlands, it seems like they are going more stylized and cartoony then real-life grit. This is something I have always appreciated about Borderlands, in that it never takes itself too seriously, and the art style definitely helped set that tone. As our white-haird elfish archer runs from said magic missiles, she jumps mid-stride over a rock, does a nifty slide under a tree branch (I’m thinking this could be similar to the awesome sliding mechanic in Bulletstorm?! ), and then free-runs her way up a tree branch more gracefully than Connor or Kenway from Assassins Creed could ever dream. If this could be any indication of the range of free-flowing motion we might look to experience first person, count me in. Games like Titanfall have already shown that we are hankering for increased and varied movement in our shooters, so let’s keep it going, keep it innovating, here! I am also intrigued about the scale of the world in this game. It certainly appears the characters are very small, given the large tree branches, rocks, and bugs they have to contend with. This could lead to some very creative level design if done correctly. At 56 seconds into the trailer, we see Steampunk Willy with his gun-cane hops down to aid our heroine, who has fallen on hard times and against a hard log, followed by the appearance of lady in dress with magical swords floating around her, a big brute with a mini-gun, and an agile-looking, duel-wielding samurai in gray and red. That’s… wait… one… three.. FIVE characters banning together at once! I have always enjoyed playing 4-player co-op in Borderlands, and the idea that Gearbox will be allowing for a fifth player in Battleborn is very appealing, given I do have four other friends that play. Near the end of the trailer the camera pans out and we see an overhead shot of the battlefield (is that a symbol of some kind we should know or recognize? ), followed by a trip into space where we see a destroyed planet, some solar flares, and the first thought this could be a very large game in it’s overall scope. Oh, and I also learned about yet another band I hadn’t heard of thanks to a Borderlands game. Let’s give it up to M83 for lending some good atmosphere to the action in this trailer. No, I don’t. Ok, so maybe 15-year-old, ultra-competitive, crazy-fast-reflexes Kevin would have been all about the Mulyiplayer Online Battle Arena scene. 31-year-old Kevin just feels he doesn’t have the energy, time, and patience to get into this very popular genre with such a high level of entry. I always here about League of Legends and DOTA tournaments being these world-wide extravaganzas, hear the stories of intense team-based battles that hinge on the most minute of tactical positioning, planning, and teamwork. I certainly respect the MOBA genre, yet do I truly understand it or want to be part of it? Gearbox may be hoping so. Aside from 5-player co-op campaign, which will have the Diablo-style loot and FPS gameplay we have all come to know and love in Borderlands, the multiplayer is being conceived and hyped by the press and fans as very MOBA. My biggest question here is if console gamers are ready and willing to accept MOBAs. It has always seemed to this point that MOBA is a PC thing, not a console thing. The only game I have ever played that might come close to a MOBA on Xbox360 was Awesomnauts, a side-scrolling, team-based attack and defense game that, while fun, resulted in a bunch of people yelling at me to “learn how to play the game, noob! You are horrible.” Now I am all about communication and light tactics with my teammates in competitive multi-player, but taking it as far as good MOBA players do… not too sure yet. Having Battleborn be a FPS could certainly add a wrinkle into the genre that will bring a new audience in. Gearbox ‘s Randy Pitchford tweeted about the multi-player component of Battleborn. Sounds like he may be staying away from outright calling it a MOBA. OK, so I apparently don’t speak MOBA or Randy Pitchford, because trying to decipher what this tweet actually means will take more time and brainpower then actually learning how to play DOTA. Since tweeting this, Pitchford has also been addressing quite a bit of criticism via twitter to fans and detractors alike, insisting that Battleborn is not a MOBA. 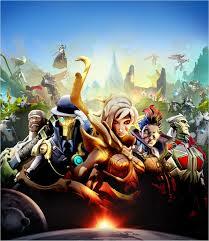 “MOBAs are fun, but Battleborn isn’t really a MOBA,” Pitchford said, adding the game will have a “deep narrative campaign” featuring heroes, villains, twists, turns, and progression.”All things being equal though, I am more excited for the co-op campaign anyways, and I will always give new IPs the benefit of the doubt. Let’s put the success and greatness that is the Borderlands franchise aside for a moment and talk a little about Gearbox over the last few years. Let’s see.. other games… Duke Nukem Forever… Aliens, Colonial Marines… hmmm… Ok, so it’s not totally fair to lay all of the blame of these two shining gems on Gearbox. The Texas-based company only partially developed and then published Duke Nukem Forever in 2011. Their hand in Aliens, Colonial Marines is a little more complicated. Published by Sega, the six-year development cycle included controversial lay-offs, out-sourcing, and business practices, as well as misleading screenshots and trailers that Gearbox rolled out during E3 leading up to the release of the game in 2013. It is the critical and financial success of the Borderlands franchise (as of this may, Borderlands 2 had sold over 9 million copies and LOTS of DLC) that continues to put Gearbox in a favorable public light, and I don’t think it’s any coincidence that Battleborn has many similarities to Gearbox’s bread-and-butter looter shooter. I would have to believe we may not get an announcement for Borderlands 3 until at least the 2015 or 2016 E3, so the reception and success of this new IP is paramount for Gearbox’s immediate well-being. I am excited to hear Battleborn will be coming out on Xbox One, PS4 and PC (something I hope also happens with the upcoming Borderlands, the Pre-Sequel). A little less excited to hear we may have to wait until March of 2016 for its release, but it’s not like we won’t have plenty of games to play between now and then. Heck, I still have expansions for Borderlands 2 to play…. tan valiosas opiniones? Un posteo muy seductor. Rapidamente a eel bookmarker! ﻿ ¿Donde exactamesnte pudiera captar un poco mas informacion acerfca de el topico? Me vale abundantemente y lo has expresado muy ingeniosamente.